1.With suspension hook. push, geared or electric trolley. 4.Low voltage control 36V is standard. 5.High efficient energy-saving motor, asbestos free brake system. 6.High tensile aluminium alloy cover is light in construction, offers strong corrosion resistance. 7.Top and bottom hooks are fitted with safety latches as standard. 8.Drop forged steel suspension & load hooks are heat treated and fracture resistant. In case of dangerous overloading or abuse, the hook does not fracture but will slowly yield. 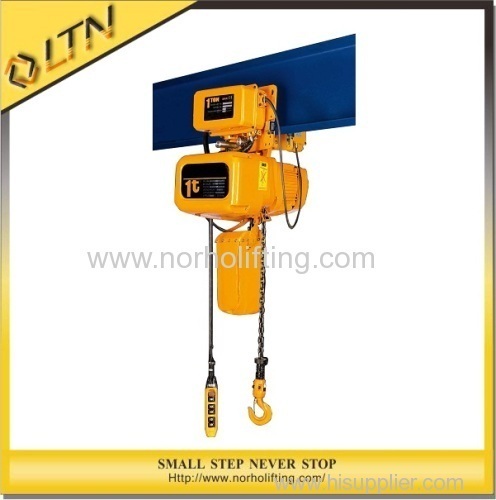 11.Limit switch devices fitted at both top & bottom ends, switch off power automatically to prevent load chain from running out. 12.The unique friction clutch overload protection, which protects the unit from overloading. 13.High quality electric components with safety protection.